Susan Gunn began her experiments with gesso whilst studying at Norwich University of the Arts. Her original training had been in textiles and experiments with film had followed. Early works relate to her later paintings through the same fascination with texture and light, an interest in the material as well as the subsequent visual effect. Gesso is a medium made by combining an animal-based glue, often rabbit skin glue, with gypsum, chalk and pigment. Associated with traditional Italian panel painting, it is used to provide a perfectly smooth substrate. At art school Gunn became fascinated by this ground, which is not intended to be seen, for its inherent beauty and the delicacy of the process. This has continued to fascinate Gunn for over a decade and her experimental process has become the distinguishing feature of her work. Applied to canvas, which is a far more flexible support than wood panel, gesso moves and cracks as it dries. Gunn’s work with her material has resulted in a depth of understanding and experience of how this process can be manipulated – gesso can be formulated and dried so that the cracking of the surface is inevitable and desirable, rather than accidental. Anticipating how this will work, Gunn can orchestrate the desired outcome, predicating but not controlling how the surface will break as it dries. The drying process is dramatic and with the emergence of the surface fissures there comes a final moment in which the surface pulls apart – in the studio Gunn can hear the instant when a painting cracks. It is the perfectly orchestrated accident that makes Gunn’s work so masterfully risky. Despite her expertise with material, humidity, temperature and scale all play a role and there are no guarantees in the outcome. 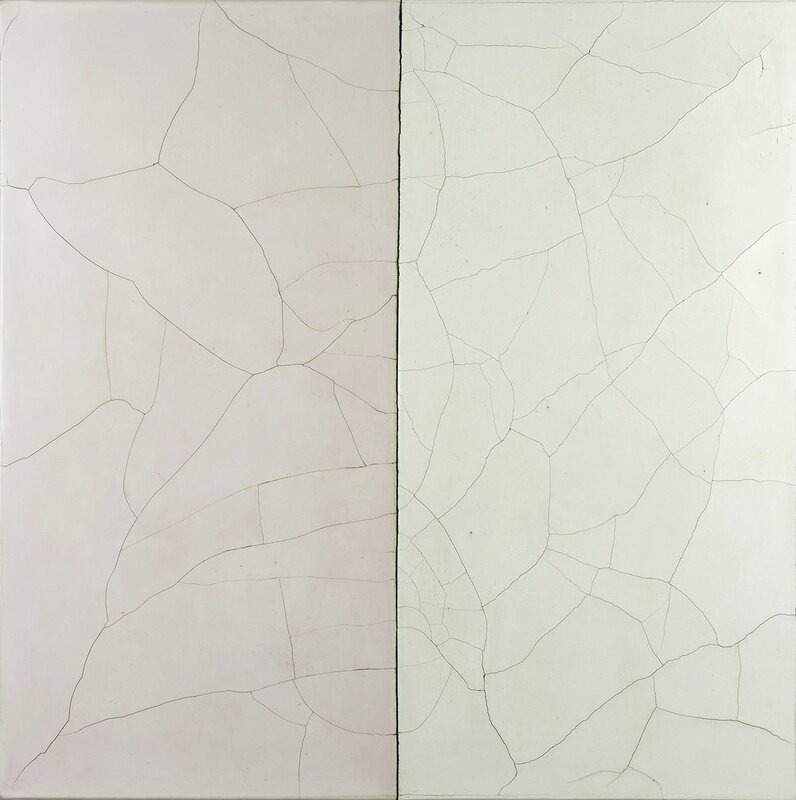 Once the surface is dry and the final pattern of cracks resolved, Gunn interferes in other ways, rubbing pigmented wax across the work, making the fissures more prominent, working to embellish the accident she coaxed in to the medium, and finally fix the work with a richly smooth stability. The variations in the process are finely judged and the results infinitely varied. A major commission in 2015 for the new Enterprise Building, University of East Anglia, consumed the artist. Consisting of 11 panels, the work took a full year to make. After the rigours of working on such a scale, Gunn returned to the studio wanting to play with her work again, free up the process, and revisit what had excited her about the broken surface. The recipe for different weights and consistency of gesso results in different forms of surface cracking. Now Gunn wanted to push her work further, manipulating it in new ways, pushing the surface to new breaking points. What followed was the Ground Fractured series of 2016. In a marvellous study in the same year Gunn took the canvas off the stretcher for the first time and folded it, forcing it back and forth, creasing the centre line. This was a new and far more aggressive intervention, Gunn recalls it was ‘like jumping off a mountain’, making her heart beat faster. The risk and thrill involved in this action makes the work subtlety new. Previous work looked almost immaculate, untouched, as if when pooled and dried the work had organically evolved, surviving through time in a way which seemed as much geological as painterly. This new work bears the clear division of physical intervention and in breaking the surface you can sense that the artist risked breaking the work entirely, as if the work has survived the making. Gunn’s work has a clear relationship to the Japanese aesthetic of Wabi-Sabi, valuing the beauty of the imperfect, irregular and transient. Gesso is inherently durable, surviving centuries, but Gunn’s work appears fragile. In the work The Spirit of Portico, made for the Manchester Portico Library, Gunn applied layers of marble dust between the layers of gesso, creating instability, provoking a reaction. In places the gesso has not only cracked, but completely detached and here Gunn has applied gold leaf, glorifying the flaw, making imperfection both precious and beautiful. These works were partially inspired looking at the work of Luciano Fontana on a trip to The Guggenheim Museum in Venice, leading Gunn to respond with a different approach to surface disruption. Other notable influences include Mark Rothko, Blinky Palermo, Yves Klein and, most directly, the artist Callum Innes who mentored the artist early in her career. In the work of these artists Gunn found common interest in colour saturation, the monochrome, the ritual of making, a discipline in composition and, particularly from Innes, the possibility of what Gunn describes as ‘un-painting’ – taking making so far and then engineering a process by which the painting is unmade. In 2009, Gunn wrote ‘The works that I retrieve from almost lost states are the most rewarding.’ In the years that have followed the artist has tested the limit of this retrieval. Works, such as Salvaged Ground and Damaged Ground, have pushed the cohesion of the surface further, allowing sections to fall away, the artist fixing the form at the brink of collapse. These have the geological, archaeological presence of earlier work but suggest a record of human use, like an ancient floor unearthed. And because of the evocation of horizontal surfaces – the works are called Ground meaning substrate, but bring to mind the ground we stand on - an encounter with them on the wall, face to face, is all the more satisfying. These works suggest many surfaces, materials and histories, and yet they are entirely and only of themselves. The complexity and simplicity of gesso, pigment and wax create again and again a flawed, unexpected perfection.